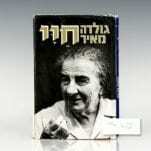 First edition of Meir’s autobiography in Hebrew. Octavo, original cloth, illustrated with eight pages of black and white photographs. 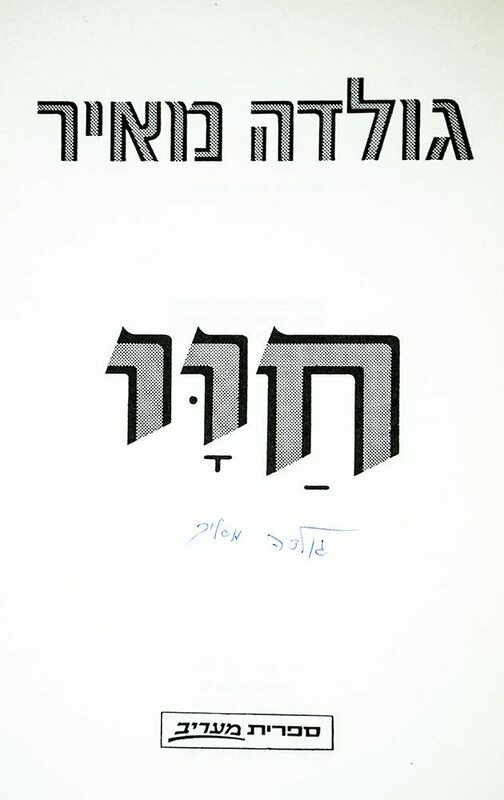 Signed by Golda Meir on the title page in Hebrew. Fine in a near fine dust jacket with a few closed tears. Golda Meir was elected Prime Minister of Israel on March 17, 1969, after serving as Minister of Labour and Foreign Minister. Israel's first and the world's third woman to hold such an office, she was described as the "Iron Lady" of Israeli politics years before the epithet became associated with British Prime Minister Margaret Thatcher. Former Prime Minister David Ben-Gurion used to call Meir "the best man in the government"; she was often portrayed as the "strong-willed, straight-talking, grey-bunned grandmother of the Jewish people." My Life is "both frank and very revealing of her personality and goals. Her total lack of pretense is especially winning. Meir's practical idealism can be seen in efforts as diverse as the beautification of kibbutzim and her strong advocacy of unemployment benefits. The work that 'most concerned and interested me,' she writes, was 'the translation of socialist principles into the down-to-earth terminology of everyday life.' Although the political events narrated are well known they are recounted with drama and spirit. Don't mistake this for just chicken soup with riposte-noodles: it's a model of its kind and a sure crowd-pleaser" (Kirkus Reviews). First edition of Meir’s autobiography. Octavo, original cloth, illustrated. Inscribed by the author on the front free endpaper, “To Max, Best wishes for a speedy recovery. 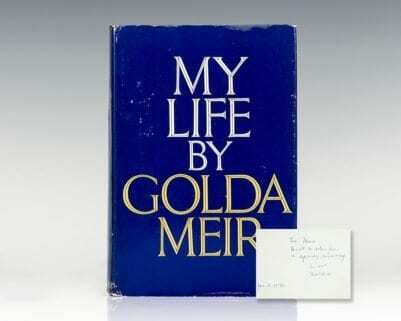 Love Golda Jan. 8, 1976.” Fine in a very good price-clipped dust jacket. Jacket design by Cheryl Asherman. 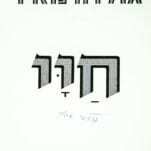 First edition of Meir’s autobiography. Octavo, original cloth, illustrated. Boldly signed by the author on the front free endpaper, “In real deep friendship and love, Golda.” Fine in a very good dust jacket. Jacket design by Cheryl Asherman. Black and white photograph of Golda Meir. 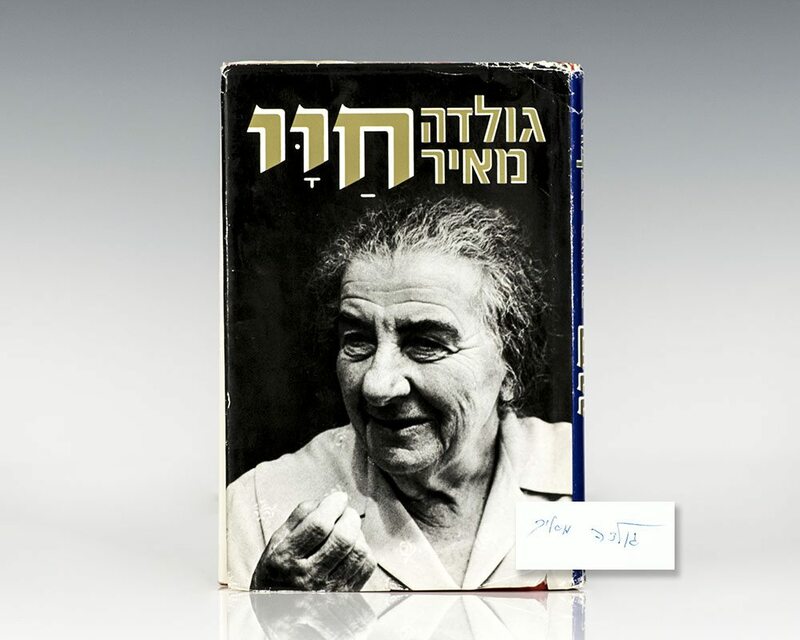 Signed by Golda Meir on the lower left corner. Double matted and framed. The entire piece measures 14 inches by 16 inches. 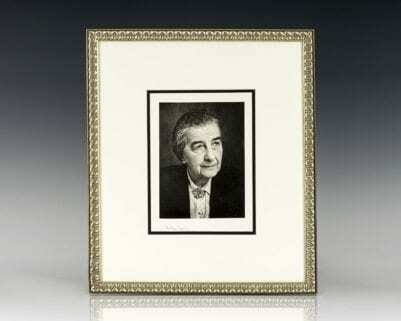 Photographs signed by Golda Meir are uncommon.